Los Angeles is nothing less than magic at night. 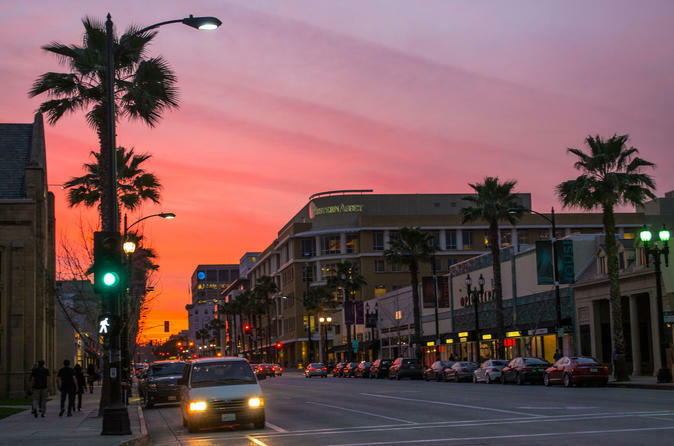 This 3-hour Private Los Angeles Night Tour is a perfect way to start or end your stay in this quirky city of glamour and history. It is a walking tour combining both must see sites and off the beaten path. Admire landmarks like Bradbury Building, Central Library, City Hall, Chinese and Dolby Theaters with your friendly local guide. See the lively evening crowd at Hollywood Boulevard and explore Financial District juxtaposed by modern neon billboards. You’ll be wowed by iconic views of Los Angeles made even better by the night setting. Take the pictures of Walk Disney Concert Hall – a clad masterpiece of modern metropolis and one of the most instagrammable spots in Los Angeles. Feast your eyes at vibrant murals, eclectic boutiques and gift shops that sell vintage clothing and accessories exuding bohemian charm. Timing is flexible and you can start the tour any time you prefer. This tour can be customized to make it a unique experience for you. Your private local guide will meet you in the hotel lobby at about 7pm and discuss the tour itinerary with you at the beginning of the tour. The itinerary is subject to change. 7.30pm You’ll start with an illuminations tour past Financial District showcasing LA's heartbeat and Downtown’s famed restaurant row. See the US Bank Tower, LA’s Fine Arts Building and other dazzling skyscrapers lit up at night. Take a good look at the 73-story Wilshire Grand, the tallest tower west of the Mississippi. Take in stunning views of the adjoining 11-story elegant Millennium Biltmore Hotel, home of Hollywood chic and the backdrop for renowned movies and TV shows. 8pm Travel through the twinkling Historic Core and Jewelry District, tour the neon-drenched area of old-style buildings, historic theaters and timeless architectural landmarks. Experience the night enchantment of voluptuous curves of Walk Disney Concert Hall, a molten blend of steel, music and psychedelic architecture.Take a moment to marvel at the iconic 27-story City Hall looking sumptuous in the color of night. The City Hall’s magnificent terracotta tower was inspired by the Mausoleum at Halicarnassus, one of the world's seven ancient wonders. 8.30pm See the 90-year Public Library made even more majestic as it lights up in nighttime. Designed in the early Art Deco style, this is LA’s most treasured landmark and it has hints of Egyptian, Roman and Byzantine influence. Peek at the sphinxes, as well as at its 13-and-half-foot lanterns and take a glance at richly decorated 12 murals that describe California‘s notable periods. Explore Olvera Street and Union Station (only on 4-hour tours which start at 6pm). 9pm The final leg of your tour takes you to Hollywood Boulevard, the multifaceted neighborhood to ramble, shop and people watch. Learn about the district's glamorous past and experience its stylish present day while sipping coffee at Ghirardelli chocolate shop (optional, not included in tour). Strut down the Hollywood Walk of Fame to catch a glimpse of celebrity glam. Enjoy the historic walk and learn about the world's most prominent boulevard. Sneak a peek at the red light on top of the Capitol Records Building – after sunset it blinks ‘Hollywood’ in Morse code. 10pm Finish your tour at the famed Chinese and Dolby Theaters. Get a glance of stardust and frenzied paparazzi at work while your guide entertains you with gossip and intriguing tales about the Hollywood celebrities. After the tour you can enjoy shopping, the local food and drink scene or else your guide will help you arrange taxi to get back to the hotel.